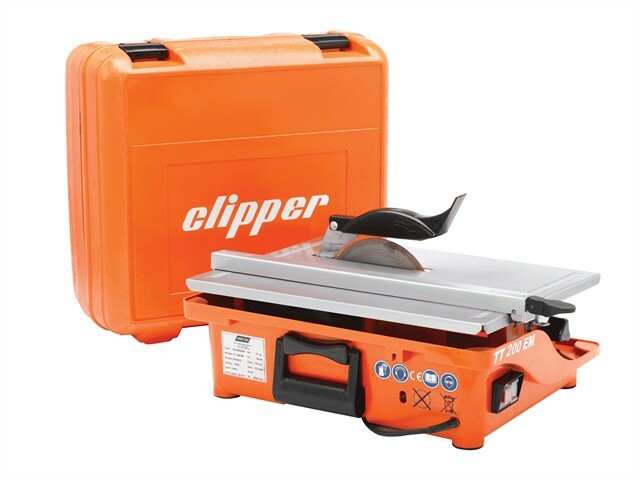 The Flexovit TT200EM Clipper is a professional and powerful tilting table top tile saw, that is perfect for mitre cuttting, from 0° to 45°. The fast and precise locking cutting guide enables a quick set up and accurate cutting. Fitted with an easy filling water tank that has been incorporated into the machine body and has a drain plug to optimised ergonomy and water recycling. There is easy access to the diamond blade, enabling hassle free changing. Delivered in a strong plastic case keeping the machine protected for easy transportation and storage. It also has a lightweight design, making it easy to move and to handle. Diamond Blade Size: 200mm x 25.4 Bore. Max Cutting Depth: @ 90°: 40mm, @45°: 20mm. Table Size: 460 x 360mm. Dimensions (LxWxH): 510 x 400 x 230mm.